When setting up a home or garage gym, you want to be confident that you have all the proper equipment available to you in order for you to get the best workout possible, so the question is, should you include a GHD machine as well? It’s a bit of an investment, and it takes some effort to get an entire gym that is as high or near the quality of the one that you would pay a monthly membership fee for. As long as you are someone that works out regularly and you will take full advantage of the gym you have created for yourself, the savings are going to add up quickly. The ghd machine will pay for itself in no time at all. Some of the equipment that you should consider when setting up a home gym are things like dumbbells, jump rope or elastic training bands, a treadmill or elliptical, perhaps a power rack, and maybe even a bench press. Those are the typical items you see when you walk into most fitness centers, so you’re going to want them with you at home as well. However, there is another ghd machine that you should include when laying out your plan that you might not have thought about right off that bat, and that is a glute ham developer. What Is A Glute Machine? 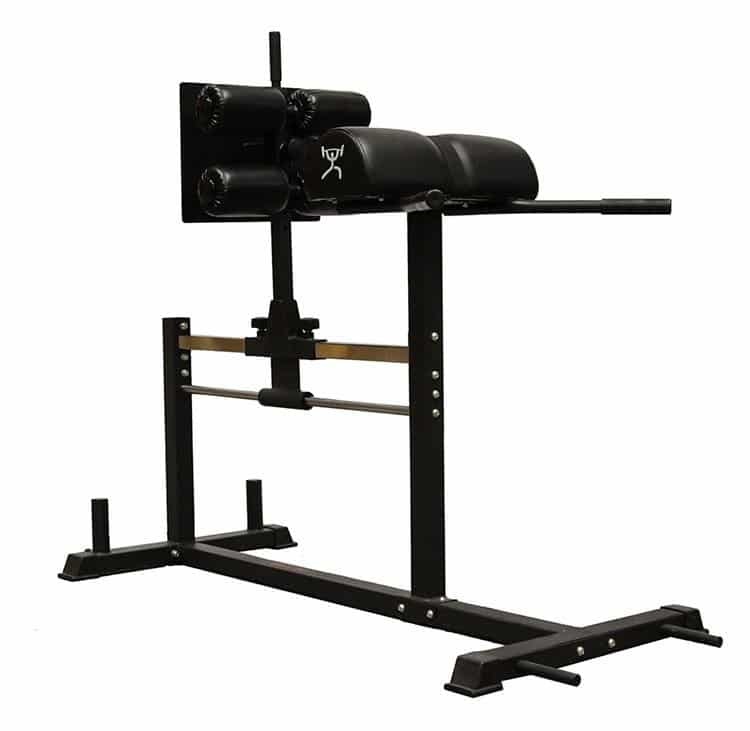 A glute ham developer machine is going to be an addition to your gym that you will be glad you made after you discover all that you can accomplish with it. What it does is allows a way for you to develop your hamstrings and glutes while doing sit-ups and back extensions. While increasing the strength of these parts of the body is possible without a glute ham raise machine, it is challenging to get results that are close to what you would using a ghd machine. 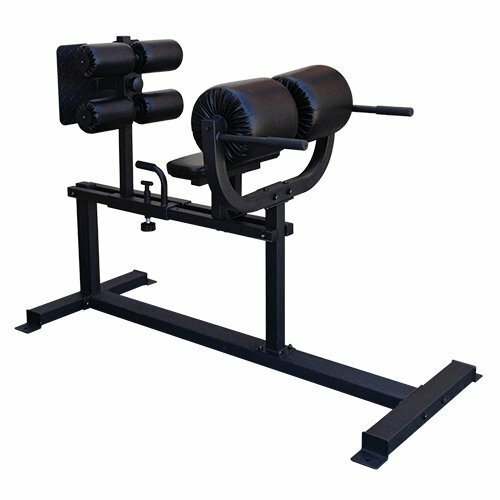 Picking a glute ham raise machine can be difficult for some because there are so many available on the market today. When you start looking for one, you will notice that there are all different kinds with multiple different features and customizable add-ons that can be purchased separately. Instead of getting lost in all the tiny details, take a look at the ghd machine reviews and get a clearer picture of what each one does and how it can help you reach your fitness goals. After going over the review of the top ten glute ham developer machines, you will have a better understanding of which one is going to work best for your home or garage gym setup. 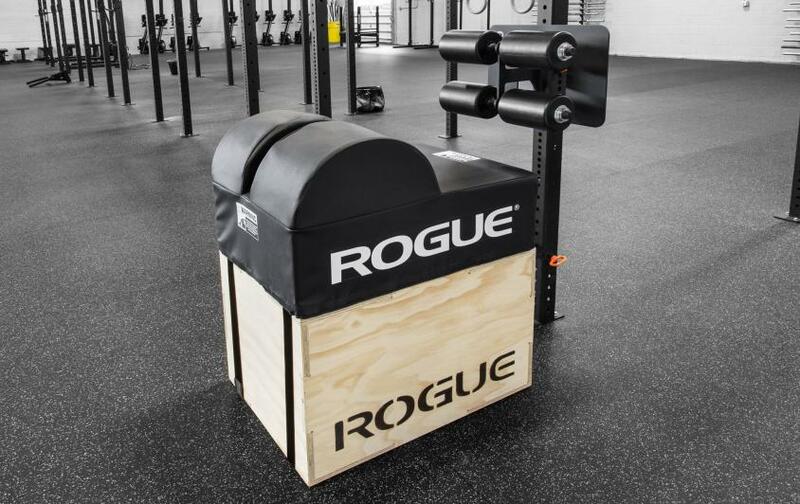 The Rogue Echo GHD machine is made in the USA, and it focuses all attention on the space-saving capabilities that make it ideal for a smaller home or garage gym. It attaches to an existing rig or power rack, so there is not any planning needed for where to put it if purchased. You also have the option of buying a flat pack games box if you do not have something available to connect it to. The box comes unassembled. This ghd machine is a little less expensive than the other standalone units on the market. 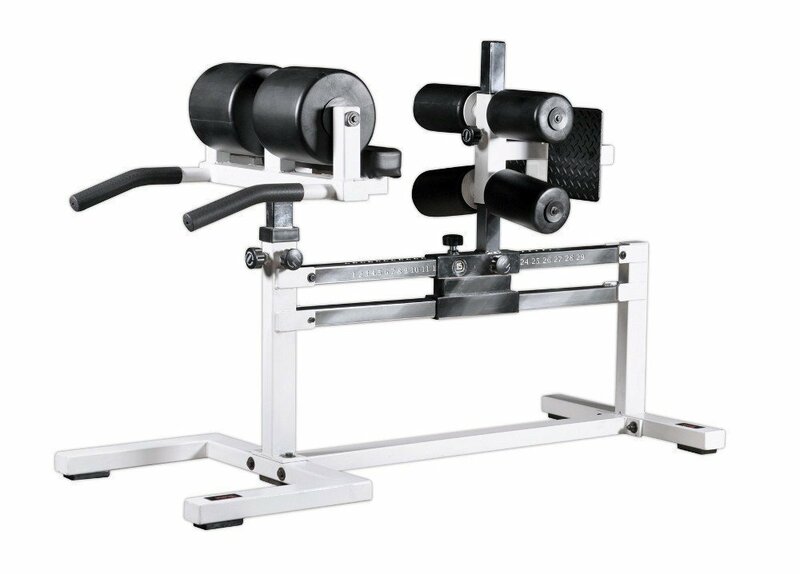 Athletes and those wishing to work on a glute ham developer can complete several different applications with this machine including glute and ham raises, hip extensions, GHD situps, back extensions, Russian twists and more. There are two different versions of the Echo GHD including the Infinity 2×3 and Monster Life 3×3. The unit comes standard with a 30” x24” GHD pad made from vinyl and a foot roller assembly. Those interested can add various attachments to their unit for an extra charge. There are non-slip features on the underside of the glute ham raise machine and seatbelt-like straps to prevent any unwanted movements and an added level of security. When trying to find an equal blend of performance and price, the Vulcan GHD is as close as you are going to get. It comes with all the features of the most premium of glute ham developer machines. There is a wide base for stability with wheels that can be put down when the machine needs to be moved. A large split pad is attached for comfort during your workout, and multiple adjustments can be made to increase that level of support for each preference. Removable and adjustable band pegs and a step-up foot plate are also included with this model. This unit is slightly different than others like it because the front pad is tilted for ultimate muscle recruitment. The rollers can also be adjusted individually. The Vulcan consists of a makeup of 2”x3” steel, and it comes with a lifetime warranty on the anchor holes and frame. It is solid in makeup but a little less expensive than the commercial-like ghd machines that are out there. It can support heavier or taller athletes that would otherwise feel as though their machine wasn’t going to support them. 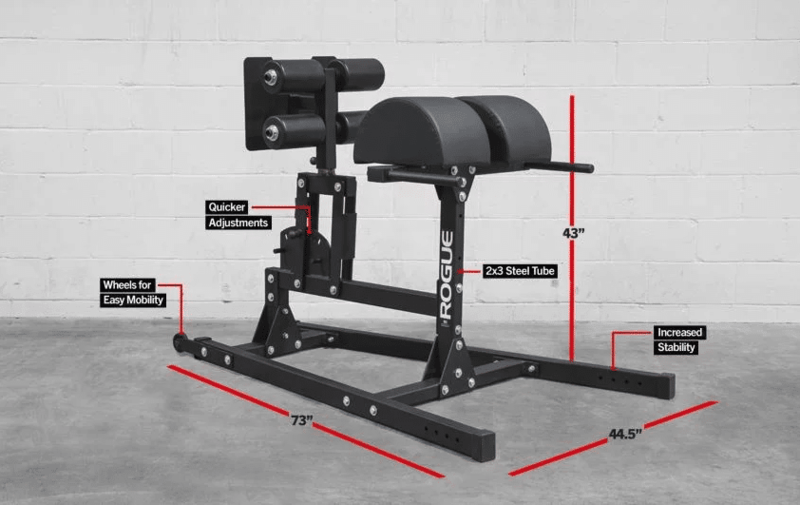 The Sorinex M2 is a trusted made-in-the-USA version of the glute machine because it has been around for many years. It was one of the first glute ham developer machines that were ever invented. Most athletes like the M2 because it is stable. Those that are dedicated to lifting like the idea that the company listens to the customer’s feedback and they make changes to their equipment based off of what people who are actually using think about it. Because of all the input from loyal lifters, there have been plenty of different versions of the Sorinex M2 since its original release. The original version was a little bit different than what is being offered currently. Some of the modifications that were made as a result of customer suggestions include a fully welded frame whereas the first one was held together by bolts. It provides an increase in stableness. For heavier athletes and lifters, there is now a plate horn where plates can be placed to weigh down the unit. Then, these larger users can get just as wild with their workout as the lighter ones do without having to worry about the machine jumping all over the place. The process for making adjustments has gotten quicker with the tilting mechanism that was added. There are also wheels on the bottom of the unit so that it can easily be moved around. Band pegs have always been present for an option of added resistance. It’s still equipped with a comfortable pad just as it has always been. 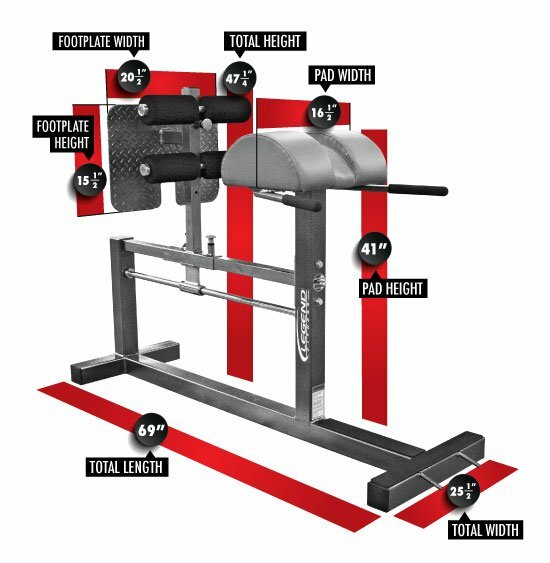 The machine is rather large, so it is necessary for anyone considering the purchase of the Sorinex M2 to have ample room to put it. It’s heavy weighing about 225 pounds. Most noticeably is the fact that numerous adjustments are capable of being made. You can change the machine around to match factors like height, shape, and any kind of exercise that you are going to be doing. 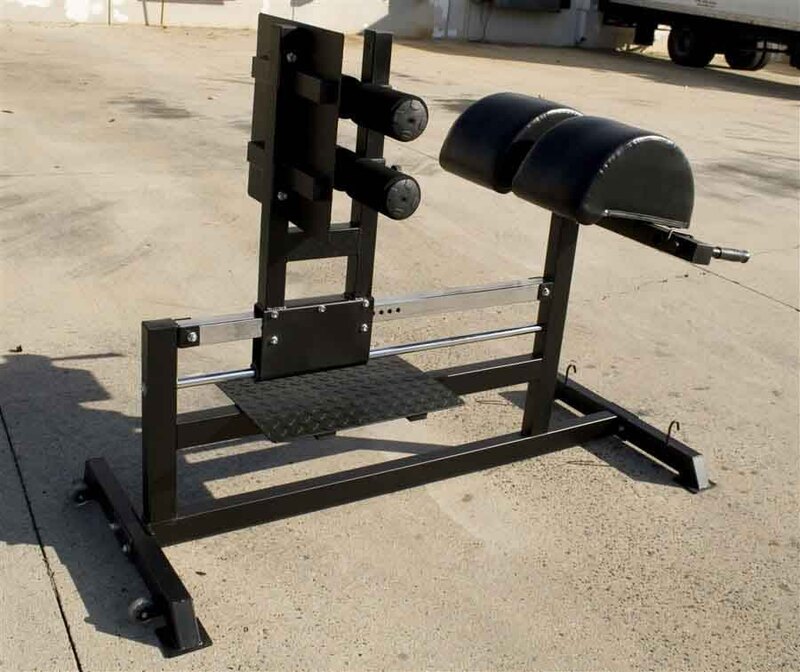 The front foot plate can move front-to-back in almost 30 various positions, whereas the more common ghd machines only move back and forth in one direction. The roller on the front and your foot plate can also move vertically and independent from one another. There are no anchor holes on the York. It comes outfitted with very thick pads and rollers, and varying sizes of foot plates are also available. It has a long and sturdy base with rubber feet on the bottom for added stability. There are positions of varying types that have been etched into the frame using a laser. That means that it is easy to counter to a different position without having to count or check any of the holes. It may seem like a tiny feature, but it disputably the most innovative addition for any glute ham developer. Some complaints have been made about the roller pads not being able to perform as well as what other machines offer, but that has not been an issue reported by all of the people using the York. Being durable, attractive, and reliable is what the brand Legend is known for by experienced lifters. A unique feature to the S Split pad glute ham developer machine that you do not see with some of the other versions on the market is the ability to customize it with any color combination you want. They have around 30 frame color choices and at least 85 fabric shades to pick from. All of their products are built to specific order, so you have to decide what you want for your combination. The downside to that is the fact that it is going to take a little bit longer for your machine to arrive. A split pad like this one is ideal for men’s comfort. There can be adjustments done on the rather large foot plate constructed of a diamond plate. It can move from up and down or back to front for each user as desired. The plate is not as wide as some of the other models which could create a problem for athletes with larger feet. For those looking for a little bit added difficulty, there are pegs that can be used for training with resistance bands. There are no anchor holes available if you are looking for a way to add stability. It is a fairly bulky machine, however, weighing 236 pounds already, so there is a good chance that unless you are a very big athlete, you aren’t going to need the added resistance from anchor bolts to hold the machine in place. There is a different model GHD by York that is also available without a split pad, but that would only really be beneficial for female users. 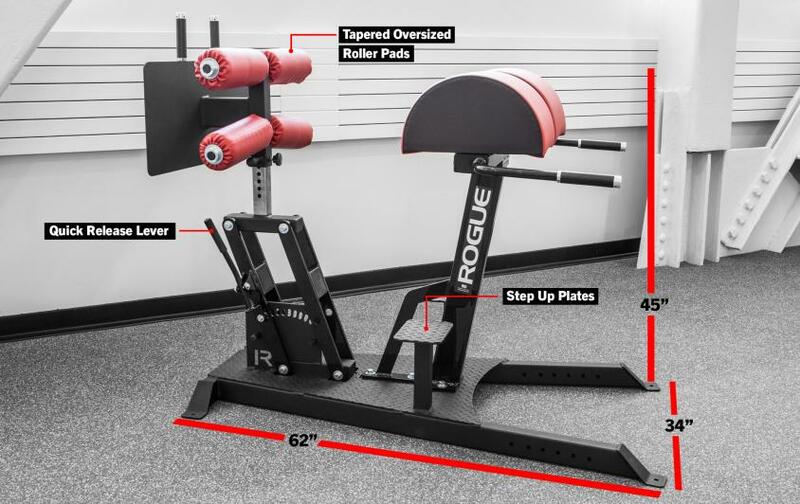 The Rouge Monster Swing Arm GHD is one of the most expensive versions of a glute ham raise machine that can be found on the market. There is a reason for the cost though, and that is because of all the features that are offered that most of the other, more affordable machines don’t have. For a basic garage gym, this might be a little bit too much. It’s a commercial-quality glute ham developer machine so unless you are really serious about working out your glutes and hamstrings regularly, it is a little over the top. It is still worth mentioning, just in case someone out there is putting together a gym without any concern of budget. There are plenty of features that make the Rouge Monster Swing Arm GHD really stand out from the rest. First of all, there are two step-up decks for easily getting into the proper position. The fully adjustable rear foot rest has also been redesigned with a plate that is larger than other standard models. The swing arm, as indicated by the name of the unit, is at the base of the machine. It can be moved to adjust your foot plate forward or back quickly to match the desired workout. The plate can be moved vertically too. The unit is massive at 250 pounds, and with the triangular shape of the frame base, it is completely safe and stable for larger and heavier users. There are double pads that are larger than other machines for additional comfort. With a new and improved triangular base and one common piece for a chassis, this is one of the more stable units. The Rouge Abrams GHD 2.0 actually becomes more stable under rigid use by athletes performing their hamstring and glute workouts. There are handles and wheels that make it convenient to move the device around. Vertical plate adjustments make for a quick and easy change up to suit the specific work out being performed. There are also ten front-to-back changes that can be done for the roller and foot-plate settings. Those that are looking for additional resistance training with their ghd machine can take advantage of the band pegs and double pads. It is one of the largest machines in the glute ham developer training category. The newer 2.0 Rouge Abram GHD is outfitted with a swing arm that allows for fast adjustments. You just pull out the pin, move the arm where you want it, replace the pin, and you’re ready to go. There is no lifting, sliding, or unscrewing and refastening necessary. The price point is reasonable compared to other models in the same GHD category. 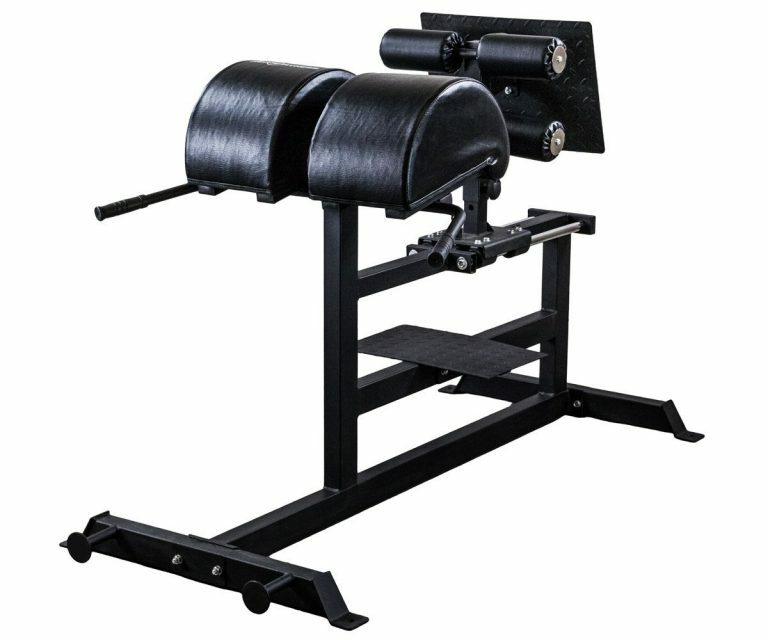 The REP GHD Commercial machine has one of the lowest price points you are going to find for a unit like this. It weighs 150 pounds, which isn’t as much as some of the other machines, but it’s still solid. It offers band pegs for the athlete looking to get in his or her resistance training. A bearing system is present for your foot plate so that adjustments for height can be made easily and quickly. Modifications can be done both horizontally and vertically. A foot plate comes partially assembled, it’s wide, and it’s mounted and secure, so it’s easier to get on and off the glute ham developer. When one person wants to move the ghd machine, the wheels on the back allow that to be done rather easily. There is a durable vinyl cover, steel end caps, and thick, high-quality padding that complete the construction of this machine. It can be assembled in around 15 to 20 minutes and is considered an easy set-up. With the lower price point, it is suspected that the steel that is described as “variable in thickness” that is used to make the ghd machine might be a little lesser quality than its more expensive counterparts. There has been no evidence on that as of yet. It comes with a 90 warranty on the pads, and a 5-year warranty for the frame should anything happen to it. The weight capacity for this one is 500 pounds, so it is perfect for larger athletes. May be damaged during transport due to lack of protection in packaging. All of the OneFitWonder Commercial GHDs are backed by the reputable Fringesport firm. 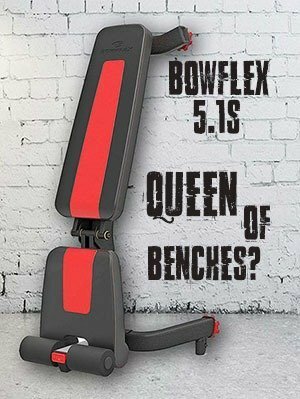 That is why it is a good choice for any home gym. It is incredibly light compared to other options out there weighing only 100 pounds when fully assembled. Chances are the lighter weight comes from lower quality steel than the 11-gauge that is most often used. The base is small and narrow, so that also has a contribution to the lighter weight of the ghd machine. Generally speaking, you are not going to want a glute ham developer machine with a narrow base. It affects the stability of the unit negatively. It will only work well for lighter, smaller athletes with the lack of support. There are mounting holes for added stability, and they should most certainly be utilized in just about every garage gym to keep the machine secure. There is a lower price point on this than some of the other models, but quality may be the reason for that. They also issue one year warranty that is included for the frame and a 90-day warranty on the pads. Adjustment of your foot plate in an up and down motion can be accomplished by using the pins that are provided. There are also screws that can be put the established position into a locked state to reduce or eliminate unwanted movements while working out. There are knee pads for a more comfortable mounting and dismounting of the machine. For those that like the added option of resistance training, you’ll have to look somewhere else as this developer machine does not have the pegs required to do that kind of a workout. 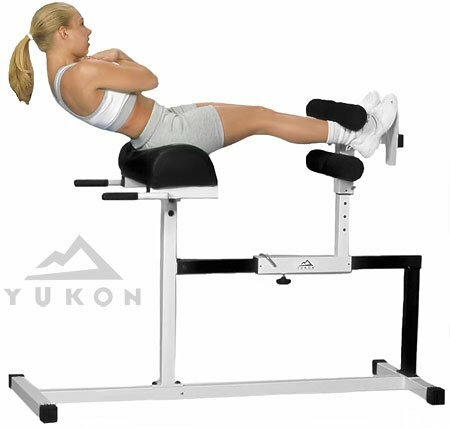 The Yukon GHD is the top machine for someone trying to put together a home gym on a budget. You get a very basic machine, but the exercise routine can still be completed effectively with proper use. There are not a lot of bells and whistles that go along with the Yukon ghd machine, but it is solid in structure. It may not be quite as sturdy as some of the other models, but you get what you pay for with this one. The pads are okay at 8-inches thick as far as quality goes, but many have reported that they have to be replaced more frequently than more expensive units. The non-slip foot plate is built-in on this ghd machine, and the entire unit is adjustable to accommodate various heights. The welds are solid on the device, and the whole thing assembles together rather quickly. It is a trusted brand in fitness, so there is not much to worry about when it comes to overall functionality and reliability. Some of the exercises that can be done on this more straightforward version of the glute ham developer machine are hip and back extensions, combination hip and back extensions, hyper-extension sit-ups, weighted hypers, and medicine ball toss and catch. When considering the purchase of a glute ham developer machine, there are several factors to take into consideration. You want to get one that is sturdy, and that can support your body weight and level of intensity when it comes to your work out. The price point is going to be established depending on what you have in your budget for your home or garage gym. You will want one that can be adjusted to fit your body height. Check for ones with extra anchor holes and pegs for resistance band training if those are things that you are interested in as well in your ghd machine.